I just finished this baby quilt for my friends Sarah and Amanda who are having a baby next month. They haven't seen it yet so I hope they like it!! I saw the monkey fabric in a store in NH and loved it and decided it would be perfect for a baby quilt. Anyways, just wanted to post one quick craft project that I recently completed: A baby hat for my coworker Suzanne who is due tomorrow! (although she thinks she'll be at least a week late). 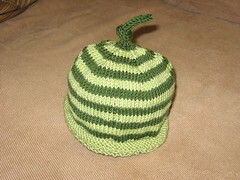 So many people that I know are having babies this fall, so I am working on a number of baby-related craft projects. More on that thought later! So, I have been exploring local eating this year and enjoying making lots of food from scratch. 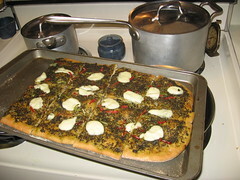 Usually it doesn't get quite as homemade as it did with this pizza, though. Thanks to a great gift from family friends, I have been learning how to make cheese! Quite exciting, delicious and also a great conversation starter (people can't seem to believe this is possible). The first time I did it, the cheese turned out really quite well, but I am still refining my technique. It's not too hard. You add citric acid to milk (can't be ultrapasteurized - for the batch here, I used farm fresh milk that a friend procured for me), heat it up, then add the enzyme rennet, stir and let curds form [NOTE: this was from the first time I made cheese - the curds are actually supposed to be less chunky and more solid/smooth than this as I have discovered in later iterations]. 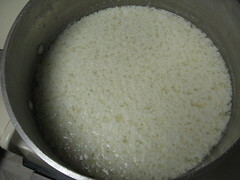 Once you have curds, you drain the whey (liquid) off the curds (this is the part that I find tricky) and then heat the curds and knead them for repeated cycles, until you get... cheese!! 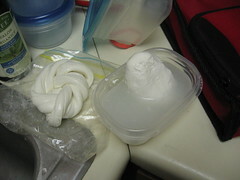 I made mozzarella but using a similar procedure you can make other soft cheeses. I think hard cheeses are trickier. Other than making the cheese from scratch, this pizza is fully ridiculous because I also made the crust (although I did not grow or mill the flour), grew the peppers and also grew the basil that I then made into pesto. And then I ate it off a plate that I made just to round out the picture. If you're wondering whether it tasted better with all those homemade inputs, I think it did! (but maybe all the work just made me more hungry). I have gotten multiple compliments on this crust, so if you'd like to try it out, the recipe is from Barbara Kingsolver's Animal Vegetable Miracle - a great book! Well, I am still learning how to use my blog. I tried to upload pictures directly from my computer but that didn't work, but I was able to do it by using a link from a photo in flickr. Anyways, this is a picture of my garden... finally going in full swing! In this photo: basil (huge, in back); lettuce, chard, carrots; mint, pepper, lettuce, parsley and cilantro, thyme. Tonight with dinner I ate home grown chard in my burrito, yum.